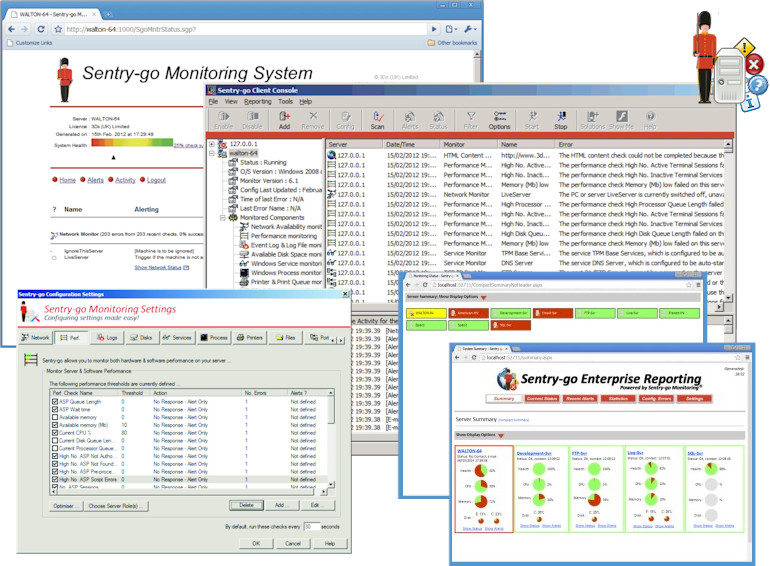 Sentry-go is a low cost, expandable, network-efficient monitoring solution for Windows. With it, you purchase & plug in the monitoring components you need for your server - add features to an existing Sentry-go Quick Monitor or build complete customised monitoring solution that meets your exact needs. Monitoring options include Windows service status, Windows process status, access to web sites & URLs, access to FTP sites & remote files, TCP/IP port availability, Windows firewall status, errors written to the Windows Event logs & text-based log files, system & software performance, ODBC database connectivity & SQL queries, Windows printers, queues & print jobs, files & directories (inc. changes made, user file access etc. ), SQL Server locking etc. For the ultimate in flexibility, the Sentry-go script monitoring component allows you to plug in your own monitoring logic & have Sentry-go manage & analyse the results! When faults are detected, automatic action can be taken in addition to the many alerting features provided. The integrated web server delivers dynamic reports to your desktop directly from the monitor itself, whilst publishing options allow key reports to be accessed externally from your own web site. The monitor is backed up by a client Console which allows support personnel to access all Sentry-go Plus! monitors in the environment either locally or remotely. From here you can see the status of each monitor, view alerts in real time, access available web reports, view and update configuration information, copy configuration values between monitors and view real-time activity details direct from the monitoring service. To help you diagnose & resolve detected faults, Sentry-go Plus! also directly links to Sentry-go Solutions, a web site dedicated to providing technical information & resources and aimed at helping you understand and correct errors more quickly & easily.